Hi my name is Gaberalla Xylia Emerald. What I am going to do here is tell you a little about who I am who I am, I am a Witch.
. I have always loved the out doors, and it always seem to be calling to me. I believe in the Wiccan Rede and stand bye it all the way. The place that has helped me out the most is Witch School, located at www.witchschool.com . I have Completed my First Degree of Correllion Tradition. When i got involved over the net it was a wonderful experance. The mentors are very helpful expecilly Rev. Morgana. She has been a wonderful help no matter how hard the answer is she is able to finds a way to explain it to me with out a problem of me understanding. Which helps out a lot. Then i meet a group of wonderful people from Witch school. 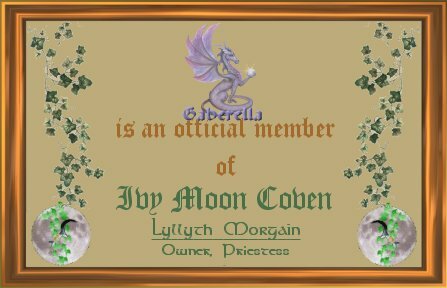 They are all a part of the Ivy Moon Coven. I've been a member since 3/5/2002. We have had online rituals. Which has been a great learning experance to all of us, and i expect to stay involved for a very long time. As of lately i have found anouther group that is also intresting to me as well. It seems to be like a very close family of females only, sorry. They seem to be very wonderful group of ladies. I just joined then about a week ago, but they welcomed me with open arms. And that was what I was looking for. I'm planning on being involved for a while cause it seems to be a place I like to be. 2/11/03 Totally fixed the page!! !